Home Opinion Is Bitcoin a Bubble? Are We Heading for a Crash? Is Bitcoin a Bubble? Are We Heading for a Crash? As various governments slowly become aware of blockchain technology and admit that there's something to these cryptocurrencies, so too do new regulations spring up – all in an attempt to collect tax and stop fraud and money laundering. With the most recent news about China and South Korea banning the collection of capital via ICOs (initial coin offerings), the whole cryptocurrency market faced a big sell-off and suffered a 25% loss in 24 hours on September 4th, 2017. Incidents like these make many financial analysts claim that Bitcoin is just a bubble waiting to burst – even the famous Robert Shiller makes such claims regularly – a really smart guy who had won a Nobel prize in the past and predicted both the stock market and housing market crash (both USA in origin, coincidentally). So who's right? Cryptoenthusiasts throwing their savings at something barely defined, or analysts with years of experience? Until now, Bitcoin has “died” 156 times. The first time was in 2010 when people claimed it would never become a currency, and the most recent (at the time of this writing) was on September 4th during the aforementioned decline due to Asian regulations. Just this year, Bitcoin died 36 times already – 8 times more than in 2016, but 5 times fewer deaths than in 2015 when it was killed off 41 times. With only 4 months to go in 2017, it's a fair bet we'll smash that record. To survive in the crypto world during these volatile times, it's important to know about FUD: Fear, Uncertainty, and Doubt. FUD is what happens when the market suffers – a viral spread of negative emotions causing a chain reaction of panic selling at prices often lower than what the purchase price was. During a viral FUD (as it happened during the September 4th 25% sell-off), those who have and can wait get to take advantage of those who are insecure and whom the FUD is affecting the most. Remember – the crypto market works in the same way as the stock market: you're always buying from someone and selling to someone. Those who know that the market will eventually recover can now buy their “stocks” cheaper, while the person who invested money they cannot afford to lose will be panic selling in an effort to minimize losses. Oh it's a bubble alright. First, it's important to know that Bitcoin is currently split into two versions, and the drama unfolding in that space is of proportions even Shakespeare couldn't dream up. Both forks of Bitcoin have their own critical downsides we'll describe in a future post, and both are running full speed at the edge of a cliff neither of them can see because they're both too busy looking at the moon. Second, small drops in market value (yes, really, 25% is still small in the cryptocurrency market – be it a rise or a fall) like the one on September 4th which was caused by new Asian regulations are nothing compared to what's in store for us. As more and more “civilians” throw their money at crypto and at projects they're barely familiar with but which are obvious scams (like Onecoin or the most recent one that's being advertised by Paris Hilton), many will lose their hard earned money after they realize that the world has run out of people who would buy their tokens and keep the level of demand (and thus price) at a desired level. Many coins are the very definition of pyramid schemes. Regulations such as the ones the Asian markets have put forward are actually good for cryptocurrency in the long term, because they'll stop the influx and outpour of stupid money in crypto. If we stop ICOs from being opened left and right by all sorts of unqualified people (have we already mentioned Paris Hilton is pitching a new coin? ), we'll stop the naïve followers of such people – like Paris' 16 million Twitter followers – from losing enormous amounts of money. The whole ecosystem will become safer. Mainstream over-saturation is inevitable, and it'll happen when every other person at least knows about Bitcoin. At that point, the value will drop dramatically, because when people realize the value stems from demand, demand will drop. With a drop in demand, prices drop, too, and this brings on the FUD. But the fact that it's a bubble isn't necessarily a bad thing. The Dotcom bubble also burst and many lost their money, but that was also dumb money. The companies that remained had clear goals, good business plans, stable investors, and a product that does what it says it does. 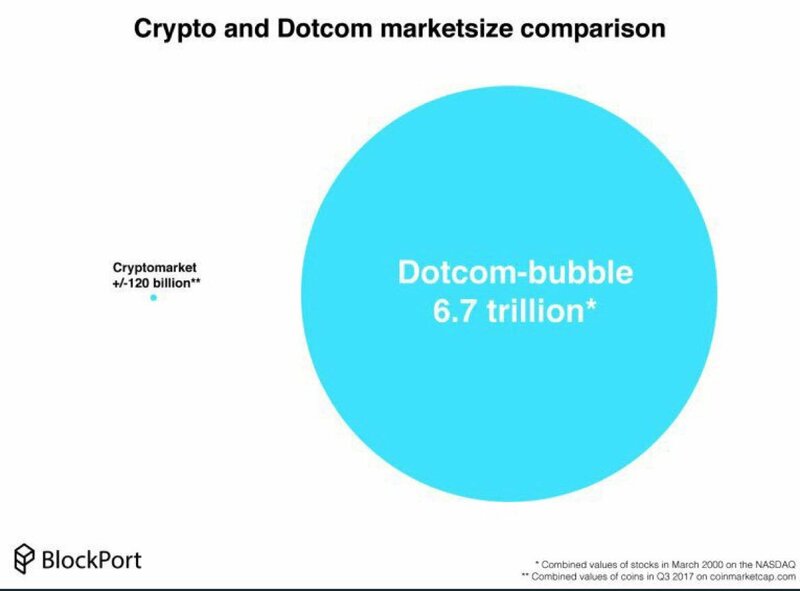 The Internet didn't disappear because of the Dotcom bubble's implosion, neither will cryptocurrencies. Rober Shiller says a bubble usually lasts for 10 years, but given that we're still far from saturation and the Dotcom bubble was worth 6.7 trillion during the crash, and cryptocurrencies in total are still under 200 billion at this point, there's still time to grow – likely in the range of 10 or so years. If you're in cryptocurrency for quick profits, use the opportunities like those on September 4th to quickly skim profits. Buy low, sell high. Bet on the growth or decline of prices with platforms like eToro. If you're in cryptocurrency for a long term gain, wait a few more years then sell it all for a massive profit. If you have none, buy now and then just wait. But if you're in it for the blockchain technology and the technological revolution that's at our doorstep, sit back, grab a drink, and relax – it's going to be a fun ride. Or – better yet – buy a cryptocurrency token that isn't rushing towards disaster and which has a technological future. Something like Ether, OMG, NEO, even Litecoin is fine. Don't forget that you can easily buy any kind of crypto token from us, as well as a safe way to store them. Contact us at contact@bitfalls.com with inquiries. ef=”https://bitfalls.com/hr/2017/08/20/blockchain-explained-blockchain-works/”>blockchain tehnologije i vjerujete u tehnološku revoluciju koja nas čeka, uzmite piće, zavalite se u fotelju, i opustite se – bit će zabavno. Ili – još bolje – kupite valutu koja ne srlja u provaliju i koja ima tehnološku budućnost! Nešto poput Ethera, OMG-a, NEO-a, ili čak Litecoin. Ne zaboravite da kod nas možete s lakoćom kupiti sve vrste kriptovaluta i sigurne načine za spremanje istih. Javite nam se s upitima na contact@bitfalls.com. Next articleHow Do Hardware Wallets like the Ledger Nano S Work?